A Hunan native who maintains an emotional distance towards her adopted home of Beijing, Tao Aimin approaches the lives of rural Chinese women with a combination of empathy and anthropological curiosity. With eloquent inarticulacy, she gives voice to their unexpressed and undocumented experiences, which are increasingly at risk of being forgotten. Incorporating found objects, painting, calligraphy, printmaking, video, and installation, her works move fluently between elite and popular culture and between the languages of traditional and contemporary art. They are bold and sensitive meditations on the issues of artistic authorship and self-representation, labor, embodied knowledge, and collective memory. These washboards form the installation Women’s River (2005), a multivalent metaphor for resilience, continuity, and transience. Many of the women who owned the washboards are illiterate and possess no visual records of themselves. Tao Aimin paints their portraits on the washboards, which are in a sense their only self-portraits. In Women’s Book (2005), she collects washboards into albums, turning them into wordless storybooks and their physical fractures into the signs of an inarticulate language. 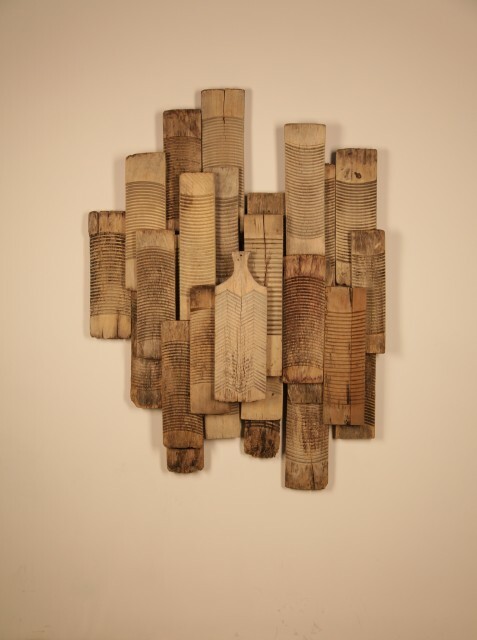 In Washed Relics (2006, 2014), she strings the washboards together with fishing lines into wall-size suspended displays that recall archaeological relics and anthropological specimens in museums. Constituted by mundane and personal objects of anonymous women, these installations are counterpoints to the monumental and universalizing estrangements of language and culture by contemporary male artists, most notably Xu Bing’s Book from the Sky series. More recently, Tao Aimin has used washboards not directly as found objects, but rather as printing blocks to create rubbing impressions on xuan paper. She thus engages the traditions of calligraphy, woodblock prints, and epigraphic studies. In Women’s Book (2005), she collects such rubbings into classical string-bound volumes and inscribes them in Nüshu, a syllabic script invented by women of Jiangyong County in Hunan to transcribe their local dialect. With these counterfactual artifacts, Tao Aimin posits an alternative literate tradition—unfamiliar to us not because it is fictive or imaginary, but because it has been suppressed and confined to the margins. Tao Aimin graduated from the Fine Arts Department of National Huaqiao University, Fujian in 1999 and an Assistant Lecturer training course in the Mural Painting Department of the Central Academy of Fine Arts in 2001. She has previously exhibited in World Art Museum of China Millennium Monument (2005, 2006, 2011), National Art Museum of China (2009), Today Art Museum (2008, 2010), Sakshi Gallery (2009), and Ink Studio (2014). She has received a Newcomer Award 2006 Chinese Contemporary Art Document Exhibition, a nomination for the Xiao Shufen Award from the Wu Zuoren International Art Foundation, and a nomination as Art China Artist of the Year in the Installation and Multimedia category (2009). Her works can be found in the collections of Yanhuang Art Museum and Chengdu Modern Art Museum, among others.